At UT Southwestern Medical Center, we’re committed to providing our patients with high-quality health care in a medically safe environment at every step of their evaluation and treatment. It’s a commitment that we back with action. In 2010, UT Southwestern launched a Quality Improvement Program to oversee clinical quality and patient safety throughout the Medical Center. Since that time, we have implemented many improvement strategies aimed at providing the best possible care for patients and their loved ones. When it comes to our patients’ health, perfection is our goal and our unrelenting mission. It helps us continually improve every aspect of patient care. It assists our patients with making informed decisions regarding their medical care. To better serve our patients, we take into account many different types of measures for quality and safety and compare ourselves at the national and state level. These measures show how UT Southwestern has been doing at providing the right care for certain common conditions and keeping patients safe. Preventive care includes making sure all patients are evaluated (and treated) for conditions including the flu and hospital-acquired blood clots. Preventive care should happen when patients are in the hospital, in order to provide the best outcomes. The influenza vaccine is the most effective method for preventing the flu and its complications. This core measure of patient care shows the percentage of patients who were assessed for the flu vaccine and then given it when it was recommended. How UT Southwestern performs: UT Southwestern Medical Center’s influenza vaccination rate is close to 100%. This outperforms the national average and reflects our status as a leader in patient care. For these scores, a higher number is better. Hospital patients are at an increased risk for developing deep vein thrombosis (DVT), or blood clots in a deep vein, usually in the legs. It can sometimes develop after a surgery or an accident because the body isn’t moving for an extended period of time. Blood clots can be serious, so it’s important for hospitals to work to prevent them and to evaluate a patient’s risks for developing them. How UT Southwestern performs: UT Southwestern outperforms the national average when it comes to evaluating, preventing, and treating hospital-acquired blood clots. The percentage of our patients who developed a blood clot while in the hospital and who did not get treatment that could have prevented it was zero percent. This reflects our status as a leader in quality and safety. For these scores, a lower number is better. Academic medical centers like UT Southwestern tend to take care of very sick patients and handle very complicated cases. As a result, we track 30-day death rates, which tell us how many patients die relative to what is expected, given a variety of complicating characteristics. These characteristics include age, chronic conditions such as diabetes or heart failure, and whether the patient was transferred from another hospital or admitted as an emergency. The scores below show the percent of patients who died, for any reason, within 30 days of going into the hospital. How UT Southwestern performs: UT Southwestern Medical Center’s heart failure patients experience a lower death rate than the national average. We meet the national average for death rates for chronic obstructive pulmonary disease (COPD), heart attack, pneumonia, and coronary artery bypass surgery (CABG) patients. For these scores, a lower number is better. “No Different than the National Rate” means that statistically our hospitals perform the same as the national average. We encourage our patients and families to share their care and treatment experiences. One of the ways we learn about our patients’ feedback is through a survey called the Hospital Consumer Assessment of Healthcare Providers and Systems (HCAHPS). 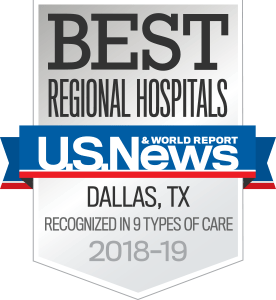 How UT Southwestern performs: UT Southwestern performs significantly higher than the national average for both overall rating as well as the percentage of patients who would definitely recommend the hospital. We are proud of our commitment to patient satisfaction and continually strive to improve our patients’ hospital experience. Medicare’s Hospital Compare: A tool provided by the government to compare how well the hospitals in a particular area care for all their adult patients with certain medical conditions. U.S. News & World Report: Compare hospital performance in adult and pediatric clinical specialties, procedures, and conditions. Scores are based on several factors, including survival, patient safety, and nurse staffing. The Joint Commission: This independent group accredits and certifies health care organizations and programs and includes information on quality and safety. Healthgrades: This website provides comprehensive information – including patient reviews – about physicians and hospitals. Leapfrog: This website offers detailed ratings and reports showing how hospitals perform.